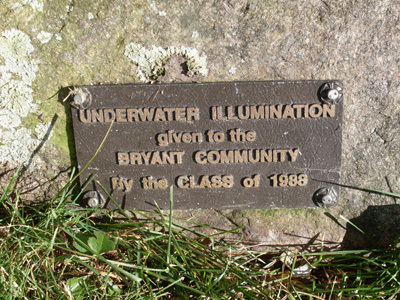 "Class of 1988 Gift -- Fountain Illumination"
The 1988 Senior Class Gift Committee decided to enhance the beauty of the Bryant Campus by providing funds to install underwater 500 watt floodlights in the pond which would illuminate the fountain at night. A plaque commemorating The Class of 1988 is affixed to the bridge. In addition, all funds contributed above and beyond what was required for the lighting were used towards the construction of the Nautilus Health Fitness Center.